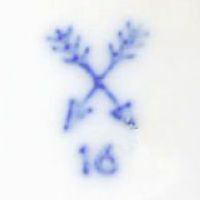 The factory itself was founded 1882 by Geyer and his brother-in-law Körbitz as a stoneware factory but officially re-registered in the year 1890 after the company started to produce porcelain. 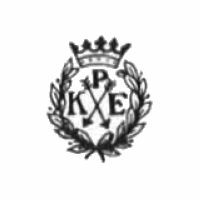 After the sudden death of Mr. Körbitz in the year 1900 his wife took over his part and so the company was now owned by Martha Körbitz and her brother Wilhelm Geyer. 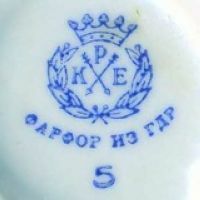 The company was the last of the many porcelain factories founded in Eisenberg and around the year 1900 the total of six different facilities located in the town employed a total of over 800 people. In 1899, Mr. G.A. Seiffert had founded the Porzellanfabrik Kalk ⇒G.m.b.H. G.A. Seiffert, which was located in Kalk, a suburb of the city of Köln in North Rhine-Westphalia. Until the factory closed later on the proprietors of that factory were the businessman Wilhelm Vogt and the manager Gustav Schwabe who both were on the lookout for a chance to expand before they met Wilhelm Geyer. 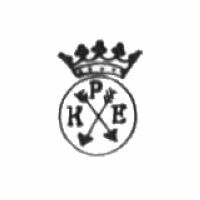 On January 1st 1900 the two companies merged and the name was changed to Porzellanfabrik Kalk G.m.b.H., which clearly indicates that Schwabe and Vogt had more influence. At this point the Eisenberg factory employed a mere 75 people but up until 1907 the number had already gone up to 200, mainly because of the success of items painted either in the 'Zwiebelmuster' (Blue Onion) or 'Strohblume' (Strawflower) decorations. The number of workers peaked at 280 in 1913 but the modernization of the factories that followed reduced the requirements and the number of workers slowly fell back down to 250 in 1930. For economic reasons the company then closed the factory in Köln-Kalk in the early 30's as the Eisenberg factory offered sufficient output capacity. Just a few years later the whole factory was closed between January 26th 1935 and May 1935 due to a fire that destroyed many buildings. After the factory was reopened, the company only needed around 200 employees as the factory had not only been repaired but also modernized. But that was not the only time production ceased; even if the factory itself survived WWII undamaged, the shortage of raw materials forced the company to close the decoration department between April and May 1945. After the war business continued as usual. In 1954 the company was transformed into a special form of limited partnership (G.m.b.H. & Co. ⇒K.G.) 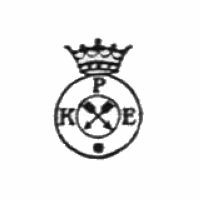 and from 1958 onwards the company worked with state participication. From 1965 onwards the factory was supervised by the ⇒V.E.B. Triptis, which changed in 1968 as the factory then was supervised by the V.E.B. Vereinigte Prozellanwerke Kahla. The business was completely nationalized on June 1st 1973; this resulted in a merger with different other companies under the name of ⇒V.E.B. Spezialkombinat Porzellan Eisenberg, but the the former Porzellanfabrik Kalk factory was closed in 1976. 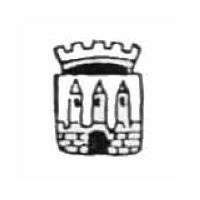 Used between 1890 and 1900. 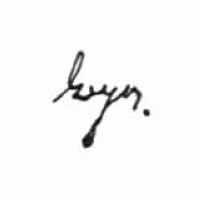 'GEYER' in script, used between 1890 and 1935. Used from 1900 onwards, impressed mark. 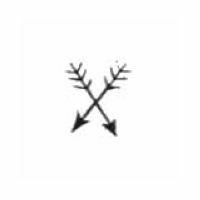 Used from 1900 onwards, stamped crossed arrows. 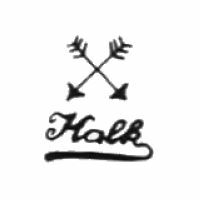 Note that Kalk only used single or two-digit numbers. 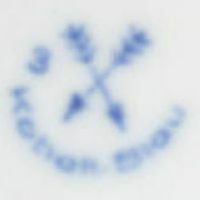 Used from 1900 onwards, blue underglaze, here with addition 'KOBALT BLAU'. 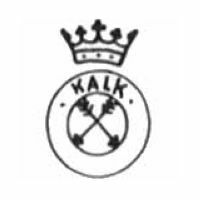 Used between 1900 and 1950. 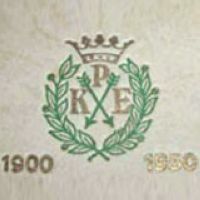 Used between 1910 and 1950. Used from 1950, here shown in blue with 'PRODUCT OF GDR' in cyrillic. Anniversary mark used from 1950.